Mycoplasma contaminations are a recurrent problem in the use of cultured cells, including human cells, especially as it has been shown to impede cell cycle, triggering cell death under various conditions. More specific consequences on cell metabolism are poorly known. Here we report the lack of significant consequence of a heavy contamination by the frequently encountered mycoplasma strain, M. hyorhinis, on the determination of respiratory chain activities, but the potential interference when assaying citrate synthase. Contamination by M. hyorhinis was detected by fluorescent imaging and further quantified by the determination of the mycoplasma-specific phosphate acetyltransferase activity. Noticeably, this latter activity was not found equally distributed in various mycoplasma types, being exceptionally high in M. hyorhinis. While we observed a trend for respiration reduction in heavily contaminated cells, no significant and specific targeting of any respiratory chain components could be identified. This suggested a potential interference with cell metabolism rather than direct interaction with respiratory chain components. The mollicutes (lat., molis, soft; cutis, skin) or mycoplasmas, with over 100 different species, are the smallest self-replicating organisms known at present and constitute a distinct class within the prokaryotes characterized by their lack of a rigid cell wall. They can be classified into fermentative strains, which gain energy by fermentation of carbohydrates and non-fermentative strains that are unable to metabolize carbohydrates via glycolysis. The mycoplasmas are extra cellular parasites usually attached to the external surface of cells, but can also penetrate these . In humans, M. pneumoniae is a frequent cause of respiratory infections, and is at the origin of approximately 20% of all community-acquired pneumonias . The mycoplasmas may also lead to genitourinary and neonatal infections . In addition, mycoplasmas have been implicated in the pathogenesis of AIDS  and rheumatoid arthritis , although their precise contribution is still under debate. Being 'minimal cells', mycoplasma have also been used to investigate the machinery of self-replicating organisms . Beside health problems, mycoplasma contamination constitutes one frequent problem when studying cultured cells (estimated frequency varying from 5 to 35%). The strains M. hyorhinis, M. orale, M. arginini, M. fermetans, M. hominis and Acholeplasma laidlawii represent 90–95% of the contaminating isolates [7, 8]. 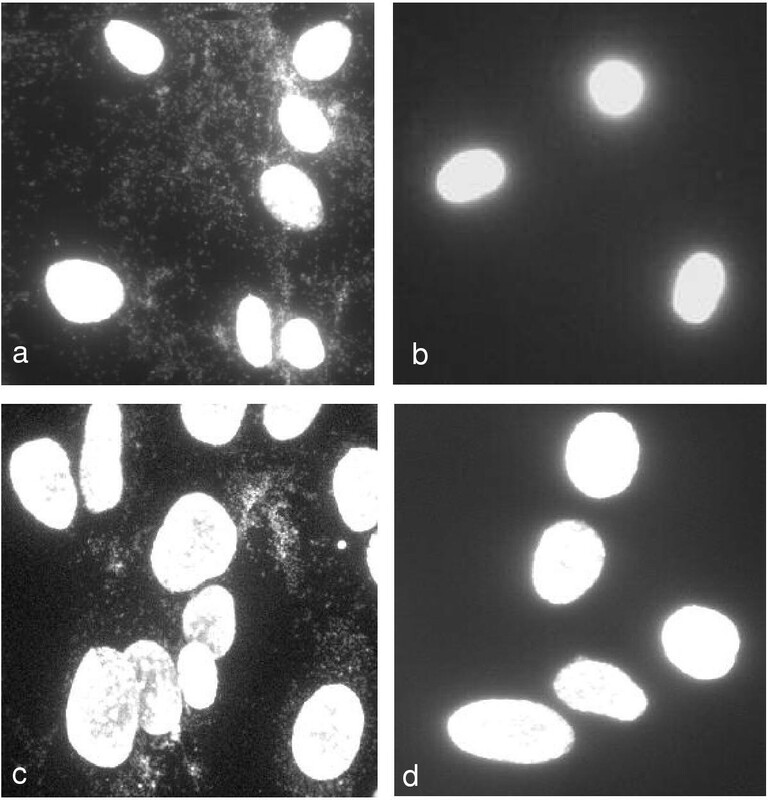 Contamination is initially often difficult to detect because the contaminated culture grows well and appears normal by ordinary light microscopy. In addition, mycoplasma is highly contagious and can rapidly spread through the cell stocks. The possible consequences of mycoplasma infection for the host-cells are multiple and variable, ranging from no apparent effect to extensive changes with inhibition of cell proliferation, induction of apoptosis, induction of cytokines and oxidative radicals, and malignant transformation [9–12]. There is also a possibility that mycoplasmal biological activities may erroneously be interpreted as being of host origin . The consequences of mycoplasma-contamination on the host cell metabolism are not well established. In mycoplasma-infected individuals, a decrease of cell respiration, dehydrogenase activities and ATP content have been described in tracheal cell explants and the cytochrome c oxidase (COX) activity has been claimed to be decreased in muscle tissue [14, 15]. In cultured cells, the consumption of the nutrients in the medium may affect the cell metabolism by interfering with deoxyribonucleic acid, ribonucleic acid and protein synthesis . The aim of this study was to evaluate the in vitro consequences of cultured skin fibroblasts contamination by one frequent mycoplasma strain, M. hyorhinis, on mitochondrial enzyme determination. In the course of this study, M. hyorhinis was quantified by a new and convenient approach using the assay of the phosphate acetyltransferase activity, absent from human cultured skin fibroblasts. The fluorescent Hoechst 33258 stain test showed the occurrence of nucleic acid-rich particles in the cytosol of four fibroblast cell lines. These were no longer observed after Ciprofloxacin treatment in any of these cell lines, denoting the initial presence of contaminating mycoplasma (Fig. 1). The strain of contaminating mycoplasma was subsequently identified to be M. hyorhinis by PCR, DNA staining and enzyme-linked immunosorbent assay (ELISA) (not shown). In situ fluorescent stain of Mycoplasma hyorhinis . The Hoechst 33258 fluorescent stain was used before (a) and after ciprofloxacin treatment of cultured skin fibroblasts (b). Positive (c) and negative control (d) were slides from Sigma Mycoplasma Stain Kit (MYC-1; 3T6-Swiss Albino; ATCC*CCL96). After Ciprofloxacin treatment, intact fibroblast respiration tends to slightly increase (about 10% more than infected cells). A similar trend was observed for succinate, and for malate plus glutamate oxidation, by digitonin-permeabilized fibroblasts (not shown). A detailed spectrophotometric study of mitochondrial respiratory chain (RC) activities was next performed on both heavily contaminated and mycoplasma-free fibroblasts (Table 1). None of the RC enzyme activities of the studied cells was found significantly changed by the Ciprofloxacin treatment. Several activities were found slightly decreased or increased upon antibiotic treatment of the cells, but the large variations associated with these measurements make these apparent changes unreliable. We next analysed the activity ratios between the components of the RC previously shown to represent the most sensitive parameters for detecting changes in RC enzyme activities [17, 18]. The differences between treated and untreated cells were not statistically different for any of the ratios (Table 1). Similarly none of these ratios was found significantly different from the corresponding value obtained from mycoplasma-free, Ciprofloxacin-naïve, fibroblasts (Table 1). Respiratory chain enzyme activities in mycoplasma contaminated fibroblasts before and after antibiotic treatment. Values are means ± 1 SD of values obtained independently on 4 different fibroblast cultures. Data between brackets represent values for uninfected, Ciprofloxacin-naïve, fibroblasts (n > 400). NQR, NADH quinone oxidoreductase; SCCR, Succinate cytochrome c reductase; GPCCR, glycerol-3-phosphate cytochrome c reductase; QCCR, quinol cytochrome c reductase; COX, cytochrome c oxidase; CS, citrate synthase; SD, Standard deviation. * These values were only obtained for three of the four infected cell lines. Interestingly enough, in the course of citrate synthase activity assay, we noticed that contaminated cell extracts readily reduced DTNB in phosphate buffer before the addition of oxaloacetate (Fig. 2A). This reducing activity was not detectable anymore in treated cells. 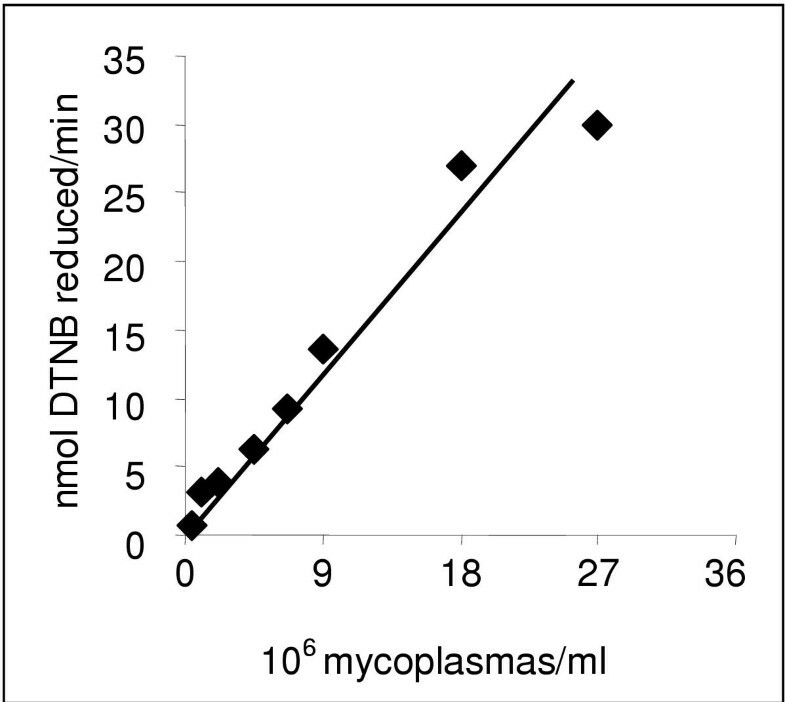 Such a rapid reduction of DTNB in the mycoplasma-contaminated cells suggested the presence of a mycoplasmal enzyme capable of cleaving acetyl-CoA. Two such enzymes have been identified in mycoplasma, namely the acetyl-CoA acetyltransferase, which forms CoA-SH and acetoacetyl-CoA from 2 acetyl-CoA, and the phosphate-dependant phosphate acetyltransferase, which yields CoA-SH and acetate from one molecule of acetyl-CoA. In order to distinguish between these two enzymes, the experiment was repeated in a buffered solution with or without phosphate (Fig. 2B). The strict dependency of the activity on the presence of phosphate indicated that the phosphate acetyltransferase activity was present in M. hyorhinis. The activity was next measured in titrated suspension of this mycoplasma. Owing to the high specific activity of the enzyme, the activity liberated from as low as 45,000 organisms could be spectrophotometrically detected (Fig. 3). For the sake of comparison, a similar assay was performed on three other mycoplasma species, M. fermentans, M. orale, M. arginini. A ten time lower specific activity was detected in the former species, while no activity could be detected in the two latter species (Table 2). Phosphate acetyltransferase activity of Mycoplasma hyorhinis can be confused with citrate synthase activity of cultured skin fibroblasts contaminated by M. hyorhinis . A: Measurement of the citrate synthase activity before (a) and after (b) treatment showing, before oxaloacetate addition, the rapid reduction of DTNB in the mycoplasma-contaminated fibroblasts as compared to treated cells. The experiment was started with the addition of Triton X100-permeabilized fibroblasts and DTNB followed by the addition of acetylCoA and oxaloacetate. B: Measurement of the DTNB reduction in mycoplasma-contaminated cells in the presence (d) or absence of phosphate (c) in the medium. The experiment started with the addition of cells and DTNB, followed by the addition of acetyl-CoA. In b and c, 10 mM phosphate was later added to the cuvette. Numbers along the traces are nmol DTNB reduced/min/mg protein and represent mean values of experiments carried out independently on the 4 different cell lines. Rather large standard variations (between 20 to 30%) were calculated presumably reflecting variable level of cell contamination by M. hyorhinis (not shown). Phosphate acetyltransferase activity in titrated suspensions of Mycoplasma hyorhinis. Measurement of DTNB reduction as a function of organisms/ml. Notice that 9 × 106 organisms represents about 30 μg protein, one color-changing units (CCU) corresponding roughly to 10 to 100 organisms . Phosphate acetyltransferase activity in different mycoplasma species. Numbers are the mean values of triplicates. M. fermantans 1 and 2 represent two different batches. DTNB, dithionitrobenzoic acid. *n.d., no detectable DTNB reduction after 20 min incubation. The contamination by mycoplasmas is a frequent problem encountered when studying cultured cells. The mycoplasmas may have a myriad of different effects upon the infected host cells, which may moreover depends on the mycoplasma species. However, all the mollicutes examined so far have truncated respiratory systems, lacking a complete tricarboxylic acid cycle and having no quinones or cytochromes, ruling out oxidative phosphorylation as an ATP-generating mechanism . Our analysis of RC activity in four human skin fibroblast cell lines heavily contaminated by M. hyorhinis indicates a potential mild decrease of cell respiration and substrate oxidation in the mycoplasma contaminated cells, but no significant effect on any of the RC components. Slight decrease of cell respiration might result from a competition in the use of intermediate substrates resulting from proliferating mycoplasmas in the cell cytosol. Although these enzymes have been reported to be commonly found in both fermentative and non-fermentative mollicutes , we found phosphate acetyltransferase mostly active in the two fermentative species (M. hyorhinis and M. fermentans). The enzyme was indeed particularly active in M. hyorhinis with two major consequences. On one hand, the activity of this enzyme can be confused with the activity of the citrate synthase, if this latter activity is not carefully checked to be dependent on oxaloacetate. On the other hand, measurement of the phosphate acetyltransferase activity represents a quite sensitive, convenient, and costless tool to detect the presence of M. hyorhinis in biological samples, particularly in human cultured cells where it represents a common contaminant. Its routine measurement along with citrate synthase assay may prove to be a valuable supplement to the diagnostic arsenal of mycoplasma detection. The above data indicate that M. hyorhinis results in a potential mild decrease of cell respiration and substrate oxidation in the mycoplasma contaminated cells, but does not have any significant effect on the RC components. With the noticeable exception of citrate synthase, our study indicates that contamination by M. hyorhinis should not influence routine diagnostic procedures used to detect mitochondrial defects in cultured skin fibroblasts. As a consequence of reduced cell proliferation and increased cell mortality, mycoplasma contamination was suspected in four human fibroblast cell lines and detection initially performed with the fluorescent Hoechst 33258 stain using the Mycoplasma stain kit (Sigma-Aldrich Co. Ltd, Irvine, UK) according to the manufacturer's description. The identification of M. hyorhinis as the contaminating species was carried out using molecular typing by PCR-based methods [22, 23]. Fibroblast cultures were established from skin biopsies obtained from 3-year to 77-year old individuals for diagnostic purpose but no evidence of RC dysfunction. Cells were cultured in RPMI 1640 (Life technologies SARL, Cergy Pontoise, France) supplemented with glutamax (446 mg/l), 10% foetal calf serum, 100 μg/ml streptomycin, 100 IU/ml penicillin, 200 μM uridine and 2.5 mM sodium pyruvate, at 37°C under standard conditions . When indicated, cells were treated with 20 μg/ml Ciprofloxacin (Bayer, Leverkusen, Germany) for 14 days and culture medium changed every 3–4 day. Ciprofloxacin treatment is considered as a safe and effective method for elimination of cell culture mycoplasmas . Polarographic measurements were performed on fresh cells before and after 1 week of the antibiotic treatment. Cell pellets frozen on the same occasion were thawed and used for spectrophotometric measurements, which were performed blindly. Intact fibroblast respiration and mitochondrial substrate oxidation with malate and glutamate and with succinate (Figure 1) were polarographically studied in cell suspensions of digitonin-permeabilized fibroblasts as previously described . The activity of the RC complexes, NADH-ubiquinone reductase (NQR, complex I), succinate-cytochrome c reductase (SCCR, complex II-III), glycerol-3-phosphate cytochrome c reductase, (GPCCR, glycerol-3-Phosphate dehydrogenase + complex III), decylubiquinol-cytochrome c reductase (QCCR, complex III), cytochrome c oxidase (COX, complex IV), mitochondrial ATP synthetase (ATPase, complex V) were spectrophotometrically measured on freeze-thaw permeabilized fibroblasts in cell suspension as previously described [26, 27]. The NQR, and ATPase activity were measured in 1 ml of 10 mM Tris-HCl buffer (pH 8.0) containing 0.8 mM NADH, 1 mM KCN, 50 μM decylubiquinone for NQR assay, subsequently added with 3 μM rotenone, 5 mM MgCl2, 10 mM KCl, 2 mM PEP, 0.5 mM ATP, 4 IU lactic dehydrogenase and pyruvate kinase for ATPase assay. Cytochrome c reductase activities (SCCR, GCCR, QCCR) were measured in 1 ml of 10 mM KH2PO4 (pH 7.8), EDTA 2 mM in the presence of 1 mM KCN, 3 μM rotenone and 0.2 mM ATP. Succinate (10 mM), glycerol 3-phosphate (20 mM), decylubiquinol (50 μM) were used as substrates for detremining SCCR, GCCR and QCCR, respectively. COX activity was measured in 1 ml of 10 mM KH2PO4 (pH 6.5) in the presence of 2.5 mM lauryl-maltoside, and 10 μM reduced cytochrome c. Citrate synthase was spectrophotometrically measured at 412–600 nm in the presence of 0.1% Triton X-100 by following the appearance of the free SH-group of the released CoA-SH upon the addition of 10 mM oxaloacetate to a cell suspension to which 100 μM acetyl-CoA and 2 mM DTNB (Dithionitrobenzoic acid; Ellman's reagent) have been added . 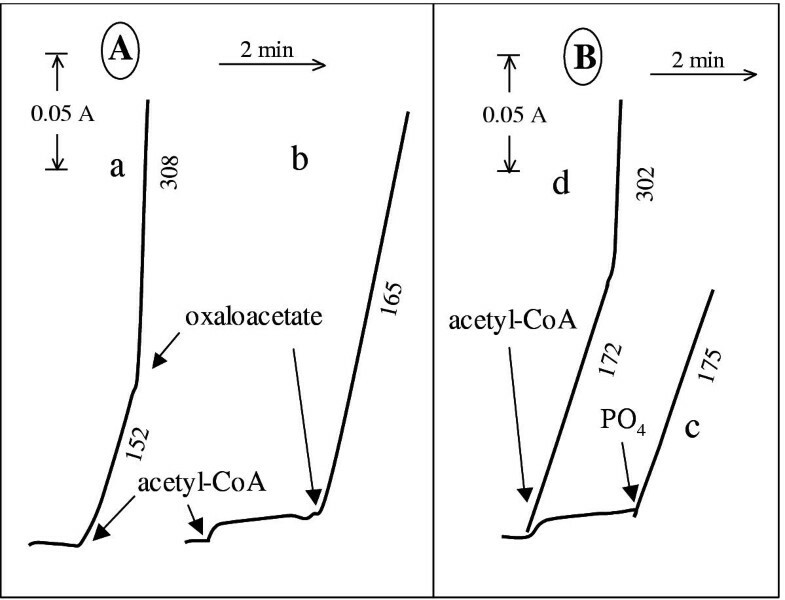 In order to discriminate between the phosphate-independent acetyl-CoA acetyltransferase and the phosphate-dependant phosphate acetyltransferase, the analysis was performed either in 10 mM KH2PO4 or in 10 mM MOPS (3-N-morpholino-propane-sulfonic acid) (pH 7.8). All measurements were carried out at 37°C and assay media supplemented with 1 mg/ml bovine serum albumin. All chemicals were analytical reagent grade from Sigma-Aldrich Chimie (Saint Quentin Fallavier; France). The protein content was measured using the Bradford method. Student's T-test was performed using the Statview 5.0 software (SAS Institute Inc. USA). ND carried out most of the polarographic and spectrophotometric assay of the RC; NK took care of the cell cultures; JJB and DC worked on the enzyme assays carried out on mycoplasma strains which were grown and provided by CB; PR conceived of the study, wrote the paper; AR and AM participated in its design and coordination. All authors read and approved the final manuscript.